Should I Have Chin Liposuction or KYBELLA? Home/Blog / Should I Have Chin Liposuction or KYBELLA®? Excess fatty tissue under the chin, called submental fat, is one of the most difficult cosmetic concerns to address on your own. Patients of all ages and fitness levels can develop what’s called a “double chin,” and slimming this area can prove nearly impossible with traditional methods like diet and exercise. Dr. Charles Perry, our board-certified plastic surgeon, offers two leading techniques to minimize unwanted fat under the chin: liposuction and KYBELLA. Chin liposuction is similar to liposuction on the body—a small cannula is used to harvest and remove the fatty tissue from the targeted area. Many patients combine chin liposuction with a facelift or another procedure, to minimize downtime and cost. 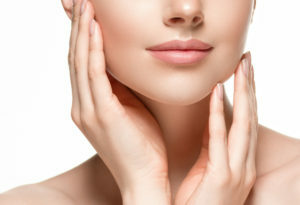 If you have loose skin and/or additional considerations you would like to address through a surgical procedure, chin liposuction may be right for you. KYBELLA is an innovative injectable treatment that can break down fatty tissue under the chin, which the body will then dispose of through normal metabolic processes. Downtime for KYBELLA is reduced compared with chin liposuction and other surgical procedures, but it’s not appropriate for everyone. You should have relatively firm skin and desire a non-surgical procedure. Dr. Perry can help you determine whether liposuction or KYBELLA is a better choice for your cosmetic goals and anatomical needs. Contact us today to schedule a consultation and learn more.